Thanks for stopping by. Bounce high, my friends! Beardies have lots of friends in other breeds. Check out the designs made especially for our friends! New designs recently added! The question on every herding dog's mind. Check out the new colors for the Herding Department! Property of the Bearded Collie Department; designs include Agility, Herding, Rally-O, Obedience and Bounce! New Products Added! Agility Beardies are known for their speed, their agile ability, and their flowing hair. Hair in the Air proudly proclaims Beardies' crowning glory! Forget an apple an day, a hug from a Beardie a day will certainly keep the doctor away, as well as lower your blood pressure and stress levels! Have you hugged a Beardie today? Check out our new merchandise with the new logo! 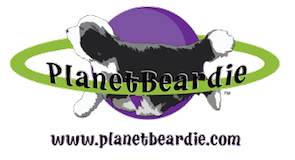 PlanetBeardie Logo now available with a Blue Beardie! If it moves, it can race! If Beardies had their own conversation hearts, they might say things like this.